I’ll be perfectly honest with you. I have a bit of a sweet tooth. And there are times when I just have a desire to eat something that has absolutely no nutritional value, but it just tastes amazingly good. 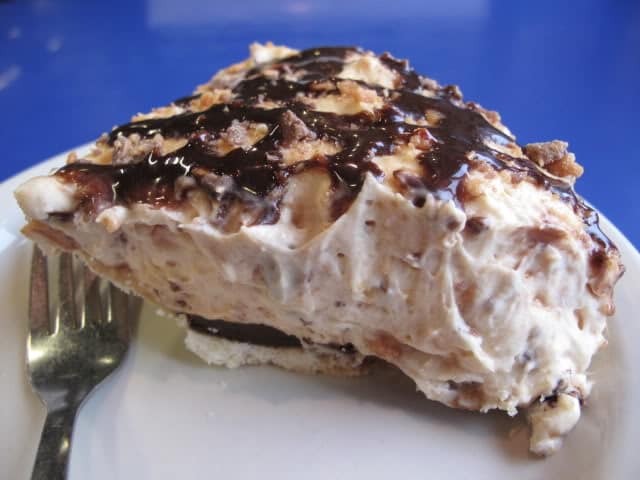 And trust me, this frozen Butterfinger Pie falls into that category. I mean, really, who doesn’t love Butterfingers?!?! And whoever decided to put it into a pie is a flippin’ genius. Unfortunately, like all things that are amazingly good but have no nutritional value, it’s murder on my Points. So, if I wanted to stay on track with my points range, I had to make a lower calorie version of this popular and simple dessert. Over at Aimee’s Adventures, I found this delicious Butterfinger Pie recipe! It’s perfect to start with, and all I had to do was make it a little more Weight Watchers friendly, while keeping that fabulous taste. A number of the Butterfinger Pie recipes have regular cool whip and cream cheese. You beat the softened cream cheese and then fold in the cool whip. This not only gives it a richer, creamier flavor – kind of like ice cream – but it helps to give it a little more structure too. I wanted to keep it light, so I stuck with just fat free cool whip. However, freezing the pie is the perfect way to get it firm without adding in the calories of cream cheese. You will need to freeze this pie for at least 4 hours. However, if you have time, I’d recommend freezing it for at least 12 hours, preferably 24. While that’s not always possible (who wants to wait a whole 24 hours before eating this amazing concoction? ), it helps to keep the cool whip solid. That makes it easier to serve and eat. One of the other things that I did to keep this recipe light was to skip the traditional graham cracker crust. Graham cracker crusts are easy to make and if I’m in a hurry, those premade one in the baking section are just perfect. The downside of the graham cracker crust is that to get the crumbs to stick together, you have to use quite a bit of butter. That really adds to the calories, fat and points in a recipe. I stuck with just low-fat graham crackers to layer into the bottom. They give you a good crust, but without the added calories. A little bit of crushed Butterfinger candy bar gives you the delicious Butterfinger flavor and adds a little crunch to the pie. I like to reserve some of my crushed Butterfinger to sprinkle on top. It makes it look very classy that way, and like you’ve put lots of time and effort into this thoughtful and delicious dessert. Just don’t tell anyone how easy it is! To top it off, you just need light chocolate syrup and sugar free caramel sundae syrup. You can artfully drizzle one syrup in one direction diagonally across and then the other can be drizzled across the other direction. The syrup just adds that little extra Butterfinger flavor and makes it look even more beautiful. This isn’t an official Weight Watchers Dessert Recipe, but it’s a great dessert idea for anyone with a SERIOUS sweet tooth (and Butterfinger craving) who still wants to keep within their points budget. A decadent dessert that doesn't hold back! Creamy, sweet, and rich, this heavenly pie is the perfect low calorie dessert recipe to indulge in. Very lightly spray an 8 x8” glass dish or pan with butter flavored non-fat cooking spray. Line the bottom with the graham cracker sheets into the bottom. Mix together the whipped topping with half of the crushed Butterfinger. Spread the cool whip mixture over the graham crackers. Drizzle both the chocolate syrup and caramel syrup on top of the whipped topping. Sprinkle the remaining half of the Butterfinger on top. Freeze for at least 4 hours. Cut into 8 equally sized pieces. Do you know how many calories are in this recipe? I for one am sooo glad you do have recipes with the old points on them! The new Points Plus does not work for me and I have stuck with the old point system. When you do get around to “switching” your recipes over…could you please still keep the old point value along with the new point value…thanks!!! Not to mention an 8″x8″ pan, cut into 8 pieces, is only a 1′ cube. For THREE points. NOT worth it! DUHHH!!!! Not 1′ cube, but still small. It’s late. I have mush for brain. Does anyone know if this is points plus points? Sounds heavenly!! Can’t wait to try it. Will exchange my nightly 3-pt. popcorn for a slice! Thanks!! I must admit I didn’t expect much from a pie made mostly of cool whip, but boy was I surprised. The key to a decadent ice cream taste is allowing for a good, hard 24 hour freeze. i keep one of these in the freezer at all times! I just made this and it does not look nearly as big as yours… it was like maybe 1/2 inch tall. Your picture is very deceiving! I just made this and popped it into the freezer (and it looks awesome! ), so I went through to calculate the PointsPlus amount and thought I would share! The entire thing is 29 points, making 1/8 come up to 3.625 (round up to 4) points +. Any idea calorie count on this??? Most of my old recipes still have the old Points, without any of the nutritional info. I never thought the Points program would change, and I’m so mad at myself for not saving all the nutritional data for all my old recipes! Argh. But I am doing my best to convert them over time, however, it’s taking me a while to gather all of the nutritional information for them. You can tell whether the recipe has the old Points or the new PointsPlus by looking at the title. If it says “Points +”, it’s the new PointsPlus, and if it says ‘Point Total”, then it’s the old Points system. Everything after the 1st of the 2010 has Points + values, as well as nutritional stats. In order to figure out the new Points Plus values to all of those old recipes, you’ll have to calculate it based on the nutritional info of the ingredients you use. Hopefully I’ll get around to updating them soon! Glad they have the old points, I do not like the points plus weight watchers. Thank you!!! The calories on this is 271 per servings. Did you crush the crackers? and did you use a square pan? Yes, I did crush the crackers myself. I just pulsed them in a food processor for a few seconds. And yes, I used a square glass baking dish, but a round pie dish is fine too. Thank you so much for sharing with NOBH. is the point value points plus? No, this is still the old Weight Watchers Points Value….I don't have the nutritional data saved, so I need to remake this dish and recalculate all the ingredients in order to figure out the recipes with the new Points Plus values. THIS WAS SOOOOOOO GOOD! Even my picky husband liked it! This is fantastic! I lined a muffin tin and made individual treats! Which is great as it turns out to be 2 pts a piece! They are soooo good! Thanks for the recipe! I am new to weight watchers and words cannot express how much I appreciate you sharing these recipes. This looks absolutely sinful! Can't wait to make it. Having it frozen will keep me from wanting to eat the whole thing in two days.